Utah Lt. Gov. 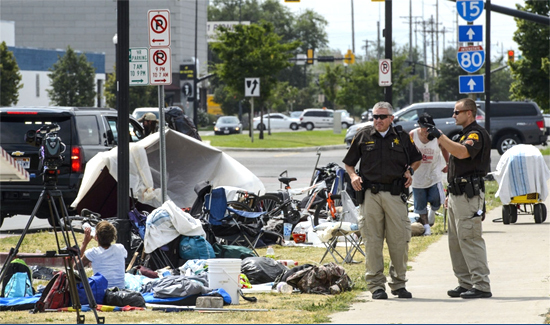 Spencer Cox and House Speaker Greg Hughes have used the phrase “worst of the worst” to describe people arrested during Operation Rio Grande, portraying them as wolves who prey upon the homeless near Salt Lake City‘s downtown shelter. But records that The Salt Lake Tribune requested from the Salt Lake County jail show only a handful of those arrested in the operation’s first month are the “dangerous criminals” sometimes described to justify the $67 million crackdown, though the data support officials’ assertion that few have been booked for public nuisance crimes like jaywalking, intoxication or camping. Of 1,106 bookings as of Sept. 13, only three involved new first-degree felony charges, the most serious in Utah, while one 37-year-old man was booked five times on charges like public intoxication, open container, disorderly conduct and providing false information to police. A total of 222 bookings involved some level of felony charge, though. And many offenders were picked up for multiple violations, including one 48-year-old man who was booked on 50 charges — mostly for drug possession. Department of Public Safety Commissioner Keith Squires said Thursday that law enforcement had never expected, early on, to handcuff high-level drug dealers. Rather, they’ve targeted the “expendable” people at the bottom of the cartel organizational chart. And the strategy has worked, he said. “We feel like we have significantly disrupted the drug activity that‘s taking place in the area,” Squires said, adding they’ve done so without causing a lasting dip in the use of homeless services.